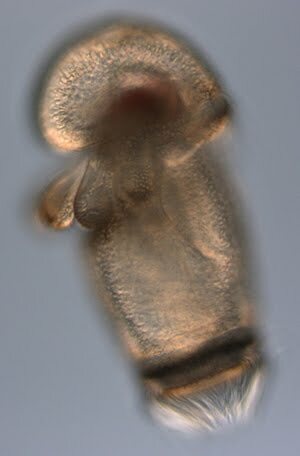 This actinotroch larva belongs to the horseshoe worm Phoronis pallida. George and I found quite a few of these in a plankton tow we took from the floating dock in Port Orford, OR in October 2009. This actinotroch is distingushed by a rather small size (about 600 micron long) compared to larvae of other local phoronid species. Like the actinotroch of Phoronis vancouverensis, it is opaque (Johnson 2002). One can tell it apart from the larva of P. vancouverensis by a pigment band located posterior to the tentacles on the ventral side (ventral is to the left and anterior is up on this picture), and the bow-tie shaped blood corpuscular mass in the hood (you can see the reddish mass in the hood on this picture taken from the side, but the bow-tie shape is only visible in frontal aspect). The telotroch - a prominent ring of long cilia at the posterior end is used to propell the larva through the water. In that same plankton tow we found LOTS and LOTS of bryozoan cyphonautes larvae. We were able to distinguish at least three kinds: the transparent and triangular ones which I think might belong to Membranipora, the oval-shaped non-trasparent ones, which might belong to Electra, and the encrusted triangular ones which might belong to a species of Conopeum (see next post). Johnson, K. 2002. Phoronida. In: An identification guide to the larval marine invertebrates of the pacific northwest. Edited by Alan Shanks. Oregon State University Press.